At FPWR, we're fortunate to have a strong community of supporters who are leading the charge so our loved ones with PWS can one day lead FULL and independent lives! 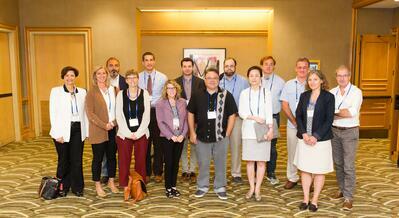 Thanks to their commitment to PWS research, FPWR has initiated a number of research projects this year. Below is our quarterly update highlighting just a few of the projects that our supporters have made possible! 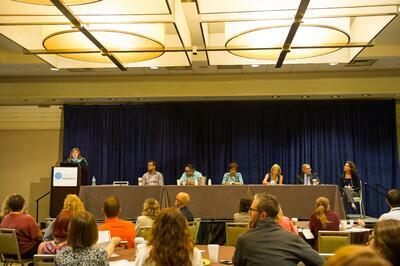 FPWR is working to develop treatments for PWS through a variety of approaches. Through continued interaction with our industry partners, several pharmaceutical companies, GLWL, Soleno, and Alize, will be advancing their drugs through clinical trials this fall or early 2018. FPWR will continue to provide support through outreach efforts to help ensure that these clinical trials move forward as quickly as possible. FPWR’s newly established Clinical Care Program is moving forward its first project, which aims to help people with PWS control their emotions through mindfulness training. Patients are now being recruited for this study, which will take approximately a year to complete. Additional clinical care projects are currently being defined, with launch dates estimated for 2018. With a number of clinical trials under way, it will not be long before we see more potential PWS drugs going before the FDA for approval. FPWR continues to lay a strong foundation for an informed drug approval process by collecting vital data on the PWS caregiver burden and patient preferences. These two surveys, which will be available for families to complete in the next few weeks, will be instrumental in defining the unmet medical need of our community and will help guide regulatory agencies (such as the FDA) when evaluating the benefit/risk of potential PWS drugs seeking approval. Pictured above: Several clinical trials for patients ages 3 through adult are currently under way or beginning soon. Representatives from 6 studies recently presented these at the 2017 FPWR Conference. One of our priorities, and an initiative of the PWS Clinical Trials Consortium, is to develop new methods to measure accurately the drug effects through improved clinical trial outcome assessments, such as measures of improved behavior, reduced hyperphagia, and increased cognition. Dr. Elisabeth Dykens and Elizabeth Roof are currently validating the Food Safety Zone Questionnaire, which has already been completed by more than 150 families. This questionnaire measures food-related behaviors in controlled environments (where access to food has been limited by locking or other measures) and will provide additional data to determine the effectiveness of potential PWS drugs on hyperphagia. In our last update, we shared a new project investigating eye tracking that is working to determine the feasibility of this technology for measuring hyperphagia in clinical trials. The Vanderbilt team has already completed their investigation with several patients. This one-year pilot study will likely require additional funding in order to evaluate a larger group of patients before eye tracking will be considered by the FDA as a valid clinical endpoint. Stay on the lookout for updates from us on this exciting project! 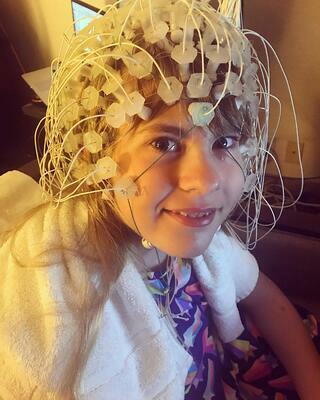 Pictured above: Sophia participates in her 3rd clinical trial helping to determine the feasibility of eye tracking for measuring hyperphagia and food-related behavior in patients ages 3 - 12 years old. An important foundational step for further development of NEW pharmacotherapies for PWS is the development of a PWS cellular assay. Assays allow drugs to be tested with high efficiency, using high-throughput screening to test thousands of compounds in one pass. First steps to creating such an assay were recently undertaken at the first meeting of the PWS Cellular Network, held in conjunction with FPWR’s Scientific Day. By developing a better understanding of PWS at the cellular level, we will improve our ability to identify efficiently new drugs for treating PWS. 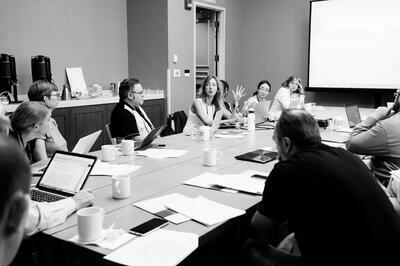 Pictured above: Workshop participants discuss next steps for creating a PWS cellular assay. FPWR-funded scientists continue to make progress in understanding the molecular underpinnings of PWS. The recent 2017 FPWR Scientific Conference brought together scientists from a variety of disciplines who are working on understanding the molecular changes that occur in PWS, which will guide the development of new therapies. An overview of the new findings discussed at the conference and a download with abstracts of the scientific presentations are available on the FPWR blog. Pictured above: FPWR's 2017 Scientific Day included 16 presentations covering a variety of PWS scientific topics, including genetics, cell biology, clinical studies, mental health, and more. 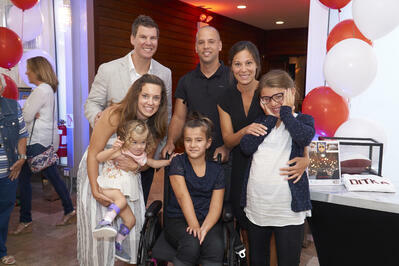 Last month, the Nelson family hosted the “I Gotta Guy Sausage Festival” in Chicago, raising over $170,000 for Magel2-related research! With the support of this event, our new Magel2 rat model, which has been under development for the past year, will be transferred to Baylor, where experts in will evaluate the model’s behavioral and cognitive profile and determine its predictive value for use in pre-clinical studies. In order to increase the accuracy of measuring drug efficacy in PWS models, three additional PWS models are also being reconstructed and characterized in collaboration with the International Mouse Phenotypic Consortium (IMPC). These projects are estimated to require 2 years to complete, but they will save time and money in the long run by increasing the likelihood that only efficacious (and safe) drugs move forward to clinical trials in humans and non-efficacious drugs are removed from the pipeline. Pictured above: Kim and Justin Nelson with their daughter Emma and the Larose family at the I Gotta Guy Sausage Festival benefitting the Foundation for Prader-Willi Research. As you can see, there's a lot going on in PWS research — and there's much more that couldn’t fit here! All of this is because of our supporters! Our thanks go out to them for making these projects happen!